To celebrate the centenary of the 1911 Parliament Act, John Bercow, Speaker of the House of Commons, instigated a series of public lectures in which current parliamentarians assessed the careers and characters of parliamentary giants. The result was a sequence of fascinating appraisals covering a distinguished but eclectic array of politicians who made a name for themselves not only in the House of Commons but also throughout the country. The subjects of the lectures came from diverse backgrounds, advocated very different political philosophies and, indeed, some make surprising bedfellows. But they all had one thing in common: driven by a set of particular beliefs, they were prepared to do whatever was necessary in pursuit of their goals. From Nicholas Soames’s warm, familial tribute to his grandfather Winston Churchill to Neil Kinnock’s account of an affectionate – though sometimes fraught – relationship with Michael Foot, the roll-call of both lecturers and subjects is outstanding. With his subject sitting in the audience, Tristram Hunt delivers the lecture on Tony Benn; Shirley Williams looks at the life of Nancy Astor, the first woman to take her seat in Parliament; Philip Norton and Peter Tapsell tackle the towering figures of Enoch Powell and F. E. Smith; as an authority on his subject, Kenneth Morgan discusses David Lloyd George, while fellow historian Gordon Marsden speaks on Aneurin Bevan; Douglas Hurd reflects on the life of Iain Macleod; and Andrew Adonis and John Whittingdale both provide an insider’s insight into the parliamentary lives of Roy Jenkins and Margaret Thatcher. 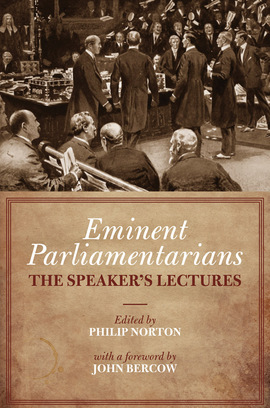 With a foreword by John Bercow and an introduction by Philip Norton, this is an impressive collection of lectures delivered by expert speakers on the most eminent of parliamentarians.